Try out this Chef Hacks recipe! Get a spiced twist on the classic fish and chips dish with Paste. The fresh taste of the yoghurt pea puree creates a great summer dish. Make up the KNORR Professional Vegetable Bouillon by boiling the water and whisking in the jelly. Whisk together the KNORR Patak's Korma Paste, plain flour and water until a smooth batter is formed. Cut them into equal sized wedges. Leave them in cold water for 1 hour. Blanch them in boiling water for 5 min. and then drain. Put the wedges into the deep fat fryer for 5 min. at 120°C. Then remove and drain. When ready to serve, cook the wedges at 180°C until crisp and golden. Put the peas into the boiling vegetable stock for 1 min. Drain the peas and retain the stock. Put the peas, yoghurt, chilli flakes and 90mls of the vegetable stock into a blender and pulse blend until you have a textured puree. Put the remaining flour in a deep tray. Add the cod pieces and coat them evenly. Take each cod piece and place into the batter and coat them. Gentle place the cod in the fryer at 180°C taking care that they don't stick together and fry until cooked. Drain on a wire rack then serve immediately. 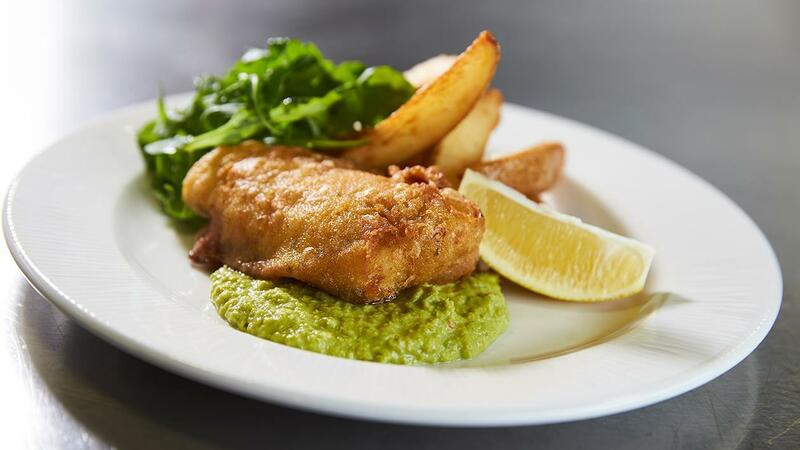 Put the spiced pea puree on the plate alongside the battered cod.